ArtsEngageCanada is dedicated to helping performing arts presenters and artists to understand and create community engagement projects. Community engagement projects cannot replace ticketed shows and other outreach activities, but they are a first, essential step towards a new, increasingly collaborative relationship between the presenter and their community. The term community engagement is often used to cover a wide range of outreach, engagement, and audience development activities. 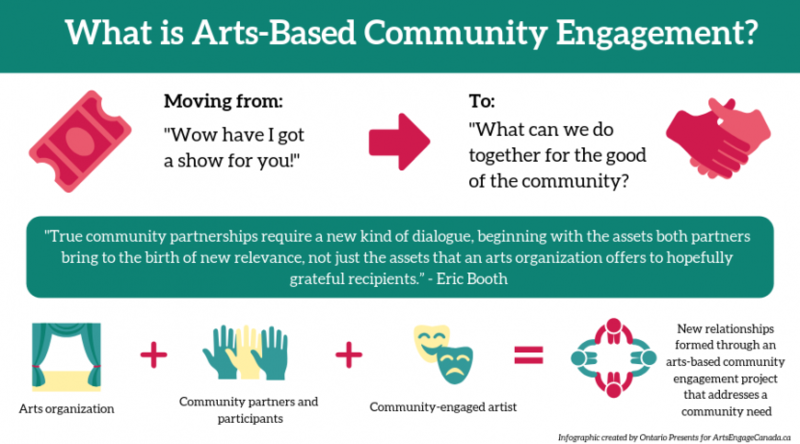 ArtsEngageCanada believes that in the most meaningful community engagement projects, presenters build authentic relationships in their community first. With their position as a community hub, presenters become a catalyst that enables the community, with a professional artist, to use an arts process to address a social issue or bring community members together. Community Engagement is a continuum. This chart is intended to help presenters to understand and track how their venue works with community. Is it Audience Development or Community Engagement?